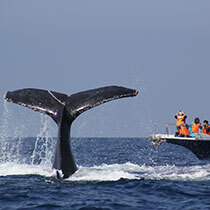 Only 10 minutes from Churaumi Aquarium!98% success rate for whale sightings! 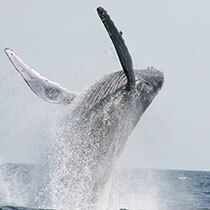 Enjoy a rare experience with the whales! Head north along route 58 after exiting the Kyoda interchange on Okinawa Expressway. About 15 mintues after entering route 449, there is a big pink sign wrote 沖縄アイランドクルー. Closed for the year-end and New Year holidays. Pick-up service available at hotel Resonex Nago and hotels in Motobu region. *Age 4 - 60 who are healthy. 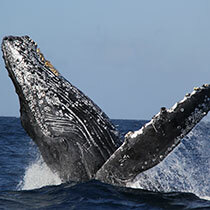 *Hours are subject to change according to whale observation status. *Infants and toddlers, and persons who are expecting may be declined to board in case local waves are high. 1. Another boarding during the service period. 2. Meal at a restaurant or glass bottom boat ride. However, they will not be applied if any of the following cases is stated. ●The blow has been seen in a far distance. 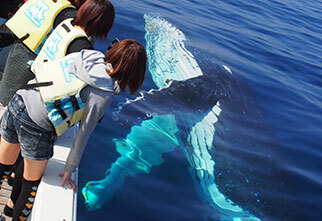 ●Some of the passengers on your vessel have seen a whale. Schedule is subject to change according to local weather condition. *Full refund will be given in case of cancellation of the tour by weather condition. *Please wear warm and a rain coat for the case you may get a splash. *Taking a motion sickness drug is recommended for those who are easy to get motion sickness. *All the passengers on a vessel must be wearing a life jacket. 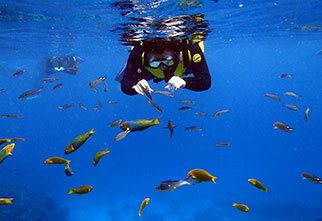 Colorful fishes and coral reefs are all to yourself for the moment!